Commentary: Green! 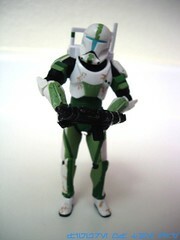 Republic Commando Fixer takes a retooled body and gives it a new shine. The coloring is a little better than the original, although the simulated weathering isn't all that hot. It still looks good, and things like jointed ankles and knees are new to this, the second version of the figure. The sculpt is crisp and he feels a little less chunky than the original, which no doubt comes in part from an evolution in video game aesthetics as Fixer now looks a little less like the bulky Master Chief of Halo fame which seemed to be a popular standard in the early 2000s. Collector's Notes: While commanding a decent price on the secondary market, I still see these in Toys R Us stores as recently as this month. It can be had if you are lucky and hunt, and if history is any indication you should get it before it starts ascending to that annoyingly high price point like The Saga Collection Delta Squad set. Image: Adam's kitchen, in front of the best-ever Wall of Voodoo LP. Commentary: Everybody loves Obi-Wan Kenobi even if the character gets a lot of figures. There are two sculpts based on his second costume from The Clone Wars, the sculpt is actually pretty good. The 2010 version looks a little better, but this may be the best as articulation goes. With nearly super-articulation present, the figure is capable of assuming a number of poses and has some nice deco on his armor. A sculpted communicator on his left wrist compliments the open circle logo on his right, and the figure is thinner than his previously-released counterparts based on the first two seasons for the show. With a lightsaber, there's not a lot of action to be had with this figure. Sitting is difficult since the robes go over the hip joints, and the figure got pretty decent distribution to the point where it's fairly common. A 2012 resculpt has a grappling backpack, which is arguably a better release than this one in terms of the overall fun factor. THe head sculpt looks wily and inquisitive, which is a nice improvement over the facial expression I've heard referred to as "dull surprise." Painted soles on his boots and a belt buckle give this figure a little more life, but eight bucks for a figure with a lightsaber is pretty weak compared to the accessory onslaught of the similarly priced 2008 figure which has more articulation, too. Collector's Notes: Common. 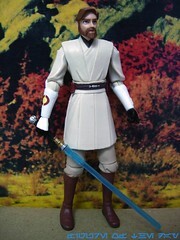 Given the endless supply of Obi-Wan Kenobi figures from the cartoon, this one isn't necessarily worth tracking down over another one, but I like it. I just wish it had more gear. Commentary: The center of Star Wars is either Luke Skywalker or Darth Vader, depending on who you ask. I think more of the old-school fans would argue it's Luke because prequels, eh. This version is a mishmash of new and existing parts, being part of the Vintage Collection's only real "repaint" wave. Of course, that's something of a misnomer as it's a retooled figure with some cool new accessories. 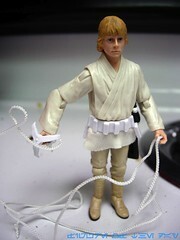 Luke is made of a new belt and cloth tunic piece, with the legs from the 2004 Vintage figure and arms from the 2007 30th Anniversary Collection release. 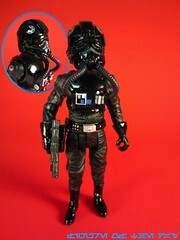 The head has been used elsewhere, arguably decorated better in the Resurgence of the Jedi Battle Pack. 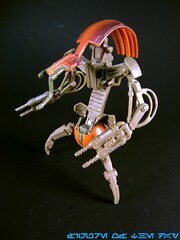 He can sit fairly well and with 14 points of articulation, has no real problems having a function as a plaything. You want to cram him in a vehicle or playset? Not a problem! 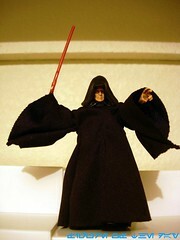 Need a figure to swing across the Death Star chasm? This one works! Collector's Notes: This wave, depending on where you lived or shopped, may have been pretty common. Luke is still around in my neighborhood at a grocery store as of when I write this, but you can probably get one online if you want to at a decent price. Commentary: Sometimes Hasbro will crank out repaints that come from a place I don't quite know. 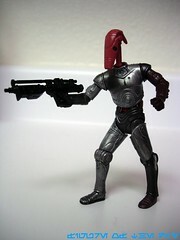 The Cylon-like Super Battle Droid hit the stores in 2008 as one of the last Battle Packs in its assortment. It has no weapons, but the deco is really nice. The dark, almost black glossy figure has covered in some nifty silver detailing. Check out the patterns on the chest and on the joints, as they make certain parts of the figure pop nicely. The gun on the hand is also decorated, which certainly helps give it a little life. The key feature on this figure is that the eyes are painted red, which really sets it apart from other releases. While not quite super articulated, this mostly-articulated figure is based on one of the better molds for this character and is totally worth getting if you aren't married to the idea that all figures you buy from these movies are actually from the movies. Collector's Notes: I saw this set at Toys R Us a few times, and online, but they're gone now. The prices aren't terrible for the set, and because of the different droids I'd suggest getting it. Each of the five figures are different enough to be interesting, but this one is particularly cool. 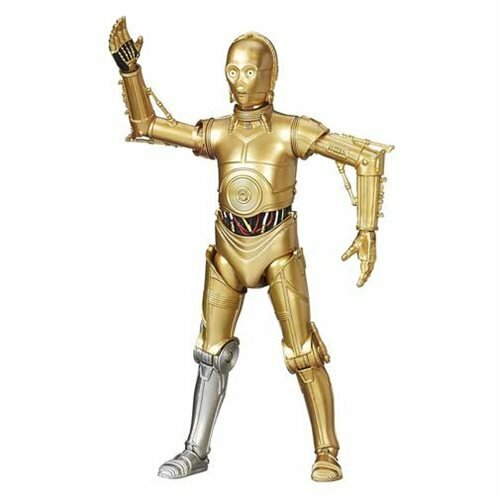 Commentary: When is C-3PO not C-3PO? When it's based on the 4-LOM body! This super-articulated figure is swimming in moving parts and fantastic paint detailing, plus it has a removable head which can be swapped out for a Battle Droid just like in the movies. This version looks way better than the 2002 deluxe release (which was subsequently repackaged in 2006 and 2007), and I assume the reason Hasbro went with the 4-LOM body, aside from it being unused most years, was because the hands were ready to grip a blaster. That's something most C-3POs cannot do. This 2-pack is a lot of fun, so if the price is right go ahead and get it. Both figures are improved over previous releases. Collector's Notes: This set dried up pretty quickly. They were all over in late 2010, and then suddenly vanished in a pile of what seemed to be a new shipment (but not new production, if you checked the date stamps, and I did) of the 2009 arena packs. The 2010 sets were pretty nice, but as they're harder to get you may have to shell out for them. I can't help but wonder if more are out there to be had, or if figures like this one are due to be repackaged in light of the upcoming 3D rereleases. Commentary: Why have one Passel Argente when you can have two? The first release from 2003 wore green, and this redeco is orange. As an added bonus, this figure has a small lightsaber slash in the chest which is a fun wound as wounds can go. OK, so maybe it isn't so much fun but it is very orange. He has limited articulation and was a part of a once-proud tradition: the obligatory year-end repaint wave. (These are pretty much gone now.) It has no special articulation to speak of, and he stands best with the support of the firey Mustafar display base. The base itself is a PVC fixture which sort of bends out of shape funny. As such, it may not be ideal. It's a decent figure, but not one that was too impressive in 2005 and today starts to feel a little bit older. It's still not bad. Collector's Notes: Not all "last wave" figures are rare and valuable. This one came out at the very end of Revenge of the Sith's toy run and came out at one per case, in few cases. Being unpopular can work wonders on keeping figures affordable, and this one still is pretty cheap. 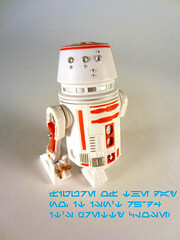 Commentary: The Red R5-Series Astromech Droid is not R5-D4, but it's close. It's so close where I think this will fall under "just different enough to make you mad," but I like this figure so much that I wouldn't ask for a Red Robot Refund. (I LOVE YOU SERVOTRON!) The dome itself is, of course, the main piece we're examining and it departs from R5-D4 and R5-D8 in a couple of meaningful ways. R5-D5's double-stripe at the top of the dome is a single (like R5-D8.) The head is clean and devoid of dirt, also like D8. It lacks the antenna of other mass-released R5 units, and the big silver stripe where the dome meets the body is gone, and is replaced by a band in between the two bands on the "neck," if that makes sense to you. If it doesn't, just nod and go along with me that this is just going to make you mad. 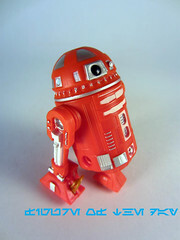 The body I went with was Red R2 with Red and White Legs. This makes it very similar to R5-D4s released before, but there are numerous red boxes on the back of the figure and any blue from R5-D4 or R5-D8 is now gone. It's a purely red robot. Certain panels have been tweaked a bit and in all honesty, the vast majority of you will have no reason to pick up this figure unless you're crazy for astromech droids and need all of the parts... and I do. 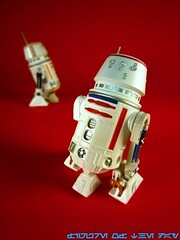 It's also very similar to the original 1979 Kenner R5-D4, which, really, is the reason I like this figure the most. Granted, it ain't a perfect Kenner update but it's nice and it's just different enough to be worthwhile, unless you're looking to cut corners in your robot stash. Collector's Notes: This item was a customizable release at Disney Hollywood Studios in Orlando, and you can configure them any way you wish. Considering there's a super-swell green version, the red R5 unit is probably going to be one of the last ones you chase down. ANAKIN SKYWALKER Backpack Fires Missile! Commentary: Fun fact: this Anakin Skywalker and the Vintage "Padawan" versions were the first new preteen figures of the character since roughly 2001. Little boy Anakin got a repaint or two in things like the Jedi High Council, but Hasbro dropped The Phantom Menace like a bad habit in 2001 and aside from a few token figures a year, it went largely ignored. Sure, there was the odd theme wave, but they were far and few between. For the 3D rereleased of the movie nobody was clamoring to see in the first place since we all just bought the Blu-Rays, Hasbro made a new "toy" figure assortment which had great sculpts and fun accessories. In Anakin's case, they also had iffy paint. While there's a delightful layer of dirt and grime with a nice paint job on his face and helmet, take a look at his belt. The area directly below the belt was left unpainted, and why I'll never know. Maybe Hasbro said "Well if he's sitting down, the clothes would be folded over and dust wouldn't get in it." But that kind of rationalization doesn't sit well with me, it looks funky and I can't really tell you that it doesn't. Anakin sports six points of articulation and has a nice likeness to the actor whose appearance in this movie resulted in his early retirement from the cinmea. The reason to buy it, aside from the decent figure, is the backpack. I love it-- it's big and goofy, it looks like Hasbro asked its 1990s Batman team to craft a Pod Racer-esque weapon for the young boy. The very notion that a small boy, even one with magical powers, just happened to build a jet-powered rocket pack of death out of junk he found laying around is so absurd you can't help but love it. It may not have a strong movie connection, but it looks sufficiently Star Wars-y, is fun to play with, and is a kajillion times better than a spanner as an accessory. It's fun, I approve. My only real beef about this figure is that it was the only new "Tatooine" Anakin designed for 2012 and it doesn't fit in the Pod Racer. None of the Anakin figures sold in 2012 fit in the Pod Racer. The only one that really fits was packaged with the original release of the vehicle in 1999, which to me shows that one thing that hasn't changed over the years was Hasbro's ability to not play with these things before they come out. 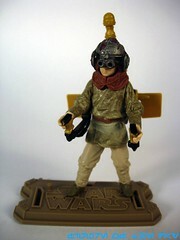 Get Anakin because he's the best version of the character in his main movie outfit-- don't get him as a vehicle pilot. Trust me. I would very much like to see Hasbro make more figures like this-- good sculpt, limited articulation, insane accessories-- so if you're reading Hasbro, nicely done, and more, please. If you only buy one Anakin figure, this is probably your best overall pick. I know, I complain a lot, but it's still really good. Collector's Notes: This figure has been in semi-decent circulation since he debuted, I've seen more of him at drug stores than toy stores. eBayers sell him for as little as $4 but he's usually closer to $13. Retail stores are about $9. Commentary: With two hoods and a name previously assigned to an Ewok god, Flitchee is something of a mystery. Even the packaging shows a different sculpt from the final figure, on the box the picture shows what seems to be a repaint of the 2009 Paploo, while the final product is a repainted Leektar head on a retooled Paploo/Leektar/Romba/etc. body, I think. Given the arm positions and a lack of a sculpted belt, anyway, that's what it seems like to me. He's pretty neat. I'm almost disappointed they stuck him in a boxed set, because he has two sets of gear to use. 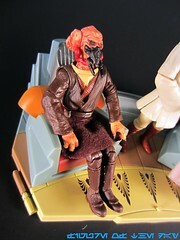 There's an all-new hood (pictured) sculpted especially for this set, but he's packaged wearing a redecorated Graak hood. If that means anything to you. So basically it looks like he's an old figure with an old head and a new sash, the weapons are rehashed from a Stormtrooper and Leektar. It's new enough to be interesting, and it has enough gear that it's basically two Ewoks in one. 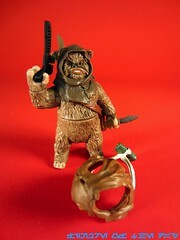 Given how I don't even know how "correct" it is since I'm not 100% sure which movie Ewok, if any, Hasbro was attempting to replicate, this guy seems to have found one that looks like the figure in Graak's hood. I really prefer the alternate hood and pouch as pictured. It's a tight fit, but it fits like a glove. The gun is a cute bonus, as a kid I frequently gave my Ewoks the guns of their fallen foes, especially after seeing the two Ewok movies on the teevee. I'm torn between his two looks, but that's why I'll probably buy another of this set as soon as there's some sort of worthwhile discount at the Toys R Us. Collector's Notes: The set started showing up about a month ago, and dang if it isn't fun. 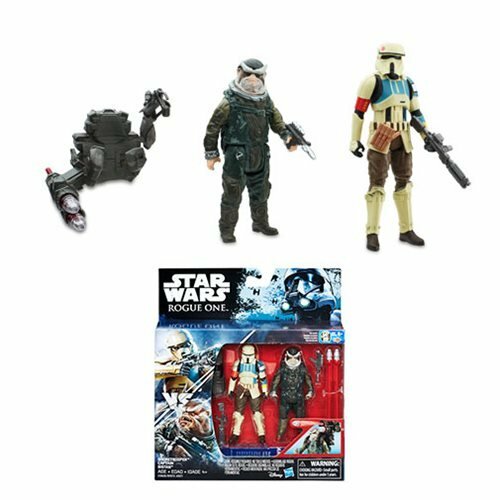 You should be able to find it with a little work, and while the bang for the buck isn't there (2.5 Ewok 2-packs should be about $25 tops, and this is $40) I find the set interesting enough-- particularly with all the variant gear-- to warrant the price. If I were buying this set on the secondary market in the future, and it's off TRU shelves, I'd have no problem dropping $50 on it. It's worth it. I pay $8 for Glyos figures, and I love those. So I can pay $8 for an Ewok. Commentary: So first thing's first, my Clone Trooper Lieutenant has no eyebrows. Looking around, it appears I got "lucky." Harrumph. Anyway. 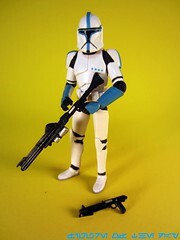 The figure is a redeco of the 2011 Clone Trooper body, which looks fantastic but like many super-articulated figures, is sort of a nuisance to pose to get to stand properly. The lack of display stands is sort of annoying, because you have a largely exquisitely decorated action figure with a few sweet spots, but getting it just right can be tricky. The plain white figure is devoid of damage, and was given blue stripes which, frankly, give the figure a lot more blue than I would have expected. I like it. The shade of blue is different from previous releases, looking closer to what we saw in the 2003 Clone Wars cartoon, even if just by a bit. The helmet sculpt and deco are great, and if your figure had eyebrows, you might not assume he is an ancient Egyptian whose cat just died. If you haven't bought one of these before, the articulation is pretty impressive. 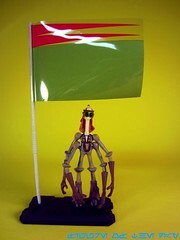 Ball-jointed hips are joined by bend-and-swivel wrists, giving the figure a very bendable 14 points of useful articulation. When you add the slick deco, it seems Hasbro is going for colors which will look better on your shelf and make you mad you army-built between 2002 and 2010. I can hear them laughing now. "Suckers!" Of course, it's borderline impossible to troop-build these days given the higher prices and lack of availability, so just get one and enjoy it. Where the figure really shines is in its weapons. Like the 2011 plain white figure, his weapons have paint operations in silver and bronze, which do a lot to add some visual heft to an otherwise bland gun. After all, most of the guns have been unpainted since 1978, which was more or less normally the case except for lightsabers starting in 1995. The overall figure, especially if you leave the helmet on, isn't half bad and is probably more than worth your while to buy if you can find it. This is, of course, the trick. Collector's Notes: Distribution is what it is, but I did see this one a couple of times over the last few days between Toys R Us and Kmart. The figure is sold in 3 different ways: a San Diego Comic-Con Exclusive boxed set, and two "vintage" packages for retail. One is based on the classic Kenner packaging, and the other is a blue and black cardback based on a rejected Vintage artwork from the 1970s. I prefer the standard black and silver, but it's certainly nice to see this new concept brought to life. Commentary: So! This one's interesting. I'll be complaining a lot here. The Nightsister is clearly in this set as a substitute for the oft-requested (and frankly, I think essential) Mother Talzin. 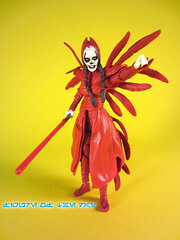 The packaging merely designates her a "powerful Nightsister" while assigning her no specific identity. Long-time fans will recognize Ian McCaig's pre-Darth Maul "Sith Witch" concept art (see: The Art of Star Wars Episode I The Phantom Menace by Jonathan Bresman, page 196), which had previously been adapted to a Wizards of the Coast Miniatures figure. When you get a close look at this figure, it's unquestionably not an animated action figure. This one has to be a rejected comic pack, concept art, or other "realistic" line release. The articulation, style, and level of detail betray this figure's origin as a non-animated figure. Hasbro pretty much phased out ankle joints by the end of 2010 when it comes to The Clone Wars, and if you get really close to this one, the texture and details are far too complex for the animated line. Her largely unlined, non-furrowed-brow face could be arguably in this line, but the eyes and face in general match Hasbro's realistic style, as does the pose, the way the dress is draped, the texture of the feathers, and, frankly, the lightsaber matches the aforementioned art book too dang closely. This is a stealth concept figure which, I gotta say, is arguably not a bad thing. 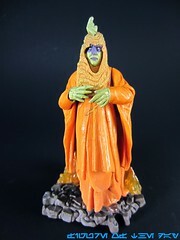 I'd rather have a proper Mother Talzin, but I'll take a concept Sith Witch too. (I know which shelf she belongs on, and now so do you.) So let's talk about the figure! She's good! If this were a $10 Vintage figure I'd encourage you to go buy her. Heck, I think you should consider her as one, with Maul and Savage as excellent bonuses. Her gold-and-silver lightsaber closely follows the uncolored McCaig concept, with a nice red blade that isn't too clear or too pale. The Nightsister is covered in feathers, some of which stick up slightly more than the concept art, but the overall look and feel of the dress, and her hair, look a lot like that original piece of art. Her plastic dress was designed admirably, it's soft and has enough give (and a sizable opening) so she can be moved into various action or combat poses, ready to fight with a lightsaber were you so inclined. The Nightsister has 14 points of articulation, and her legs are surprisingly free of obstruction with articulated knees and ankles to boot. I never would have assumed, I'm surprised. Her hands swivel, and have no problems holding her lightsaber. The figure is largely red and free of extraneous deco, but she's more colorful than the original artwork. All I can say is that it's a fantastic figure with a misleading name. Prequel concept fans, or generally cool figure fans, this is worth tracking down. Despite the ridiculous nature of the "we cut off Darth Maul's excretory abilities so of course he's still alive" angle, these are three top-notch figures which you have no reason to skip. At all. I don't care what your collecting proclivities are, this is a good set for the money and you should get it. Collector's Notes: Yakface cites Hasbro as saying: "Hasbro explained this as not having enough lead time to develop a proper figure given the fluidity of the design changes for the show." Which, all due respect, would be a load of crap on Hasbro's part. Mother Talzin's first appearance in the cartoon was January 2011 and the character design was probably finalized at least two years (or very close to two years) ago. Hasbro has said that it takes 12-18 months to design a figure, and unless my math or sense of time is wonky, and I fully admit it may be, this doesn't add up - after all, Mother Talzin and Savage Opress were introduced in the same story arc, and we got Savage's first figure in late 2010. Anyway. 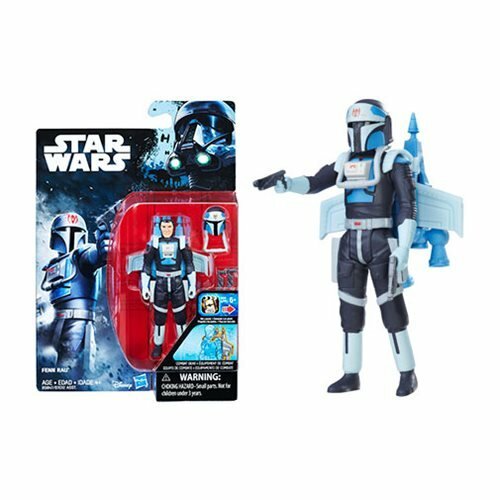 The set is exclusive to Target, and its street date coincided with a "Darth Maul Returns" DVD with the final episodes of season 4 of The Clone Wars. As of right now, it should be in a store near-ish you. For $20, for what it is, it's still a good deal. It also makes me want to see if Hasbro can ever do more animated-style Nightsisters, a new Asajj Ventress, and Mother Talzin. I don't know if you've been watching the show at all, but Asajj Ventress' story arc gives her the most growth and the most to do as of late, rivaling or arguably besting Ahsoka in terms of development. These evil witches steal the show, and are woefully underrepresented in a line as the claim goes around that female characters and female fans of the show are the new "let's engage this demo!" group. Image: Adam Pawlus' former back yard. Commentary: Part of me thinks that R5-D8 exists because Hasbro did one for Galactic Heroes (R5-D4 prepackaged) and had to do it for the figure line. I could be wrong, because R5-D8 the action figure has new and different deco from R5-D4, but Galactic Heroes R5-D8 has different deco than Action Figure R5-D8. Galactic Heroes R5-D8 (which was later repackaged with no changes as R5-D4) featured yellow stripes painted in the red parts of the figure which I thought were weird, but they're also present on the new Jek Porkins figure's helmet. So now that we have two R5-D8 toys with notably different deco, it's a safe bet that Lucasfilm never really developed a template for this droid and for all intents and purposes, toy designers get to make it up as they go. Which, frankly, I'm cool with because these little differences are far more interesting than always coming out with a sanitary, consistent, identical product all the time. To judge this figure on criteria like "film authenticity" is almost laughable, because the number of people who could pick this figure out from the movie before getting a toy of it is minimal. To make this new droid-- or at least, one that looks distinctive-- Hasbro used the R5 build-a-droid mold and slapped on some different colors. The reds are richer and deeper, the blue stripe below his dome is painted, the segments on top of his dome are now silver, and many blue chest panels are now silver as well. 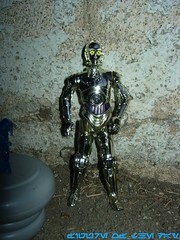 The droid is clean, with pale silver eyes and a backside that's bright white and largely blank. While R5-D5 has a double-border along the top of his dome, D8 has but a single line, and no lines highlighting some of his panels on the sides of his head. To anyone who owns an R5-D4 figure, or at least to me, there was no doubt that this figure was decorated differently from what I had. It's similar, sure, but different enough to make things interesting. Which is good, because that makes Mauler Mithel the dud of the set. For a figure I always assumed would be a straight-up repack of R5-D4, I'm delighted Hasbro opted to change the deco of R5-D8 to make it enticing as another white R5 with red, blue, and silver highlights can be. With little reference with which to compare him, I'm going to say Hasbro did a great job, as I have no evidence to the contrary. Their interpretation, or translation, of this figure to plastic is colored differently enough that even if it's wrong, I still dig the new and different design for what it is. I believe Hasbro reused an R5-D4 photo to identify R5-D8 during the Power of the Jedi Force Files, so either Lucasfilm used the same prop and Hasbro decided to mix things up a bit-- which is fine by me-- or nobody really knows what this robot should look like... which is also fine by me. Collector's Notes: This set is $40 at Toys R Us if they have it which, well, it's a mixed blessing. Basic figures are $9 or $10 these days, so 5 for $40 works out to $8 per figure. It's tolerable, especially compared to the short Ewok pack at $40... and Ewoks were 3 for $10 during Walmart's last comic pack, and that was regular retail. I really liked the yellow markings of the Galactic Heroes Porkins Droid, but since most of you cats probably didn't get that one, well, you don't know what you're missing. It's neat. Commentary: The Red R9-Series Astromech Droid kicks off our look at these quasi-figures, because, let's face it, they're tough to categorize given there are technically near-infinite mismatched combinations of body parts from which to build. Sold sort of like a Mr. Potato Head, you can go to Disney Hollywood Studios (not Magic Kingdom, not Epcot) in Orlando and put together a droid of your choosing. Since the eyes are the windows to the soul, I figure the head is where we're going to assign names and as such, each "Droid Factory" figure will be written up by its dome and one of many possible builds. Special thanks to Mike, Michael, Shannon, and Daniel for your assistance in these upcoming 25 or so features. (But not all at once, of course.) Why R9 first? That's what you guys voted for, so here goes! The design for the R9-series was pretty off my radar, basically anything not appearing in the games or comics or toy line is invisible. 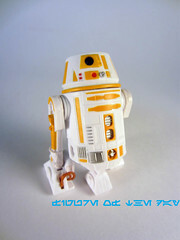 It might just be the deco or materials used, but I feel the R9 is the weakest of the astromech droid dome sculpts. It just seems a little soft, of course the illustration isn't exactly brimming with detail. The eye is a little small in spots, it's that the deco isn't doing it any favors. The silver blips around the "neck"add some sparkle, but the molded detail like the projectors are all quite small and a blue dot on the side of the head blends into the silver. I appreciate that it's there, it's just that I didn't notice it despite it being on my desk for a few days. The "floppy drive" under the eye is also gone, so that slot for data or what have you isn't there. I'm not saying it's a bad design, and since it's a largely unknown one my criticisms are based entirely on a comparison with a drawing I saw from a magazine scanned and posted on the web. As a design unto itself, it's cute. As an authentic recreation of an existing design, I'm not so sure. Like the R9, the R8 almost feels like a design step back from R2's dome and seems simpler. 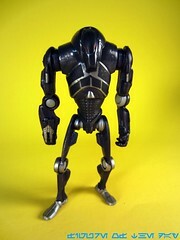 If this is how the older droids in The Phantom Menace looked I'd say "Ah, OK, that makes sense." From a design standpoint there's just so much more going on with R2-D2 or R4-D4, The blue one looks like it has more visual pop, but we'll get to him later. The red one is neat and different than other droids you have, which is cool, but since we now know Star Wars at Hasbro will be running up through 2020 (barring a crisis) I suspect we'll see another take on this model eventually. Collector's Notes: This item was a customizable release at Disney Hollywood Studios in Orlando, and you can configure them any way you wish. I wouldn't go too crazy with the mismatched legs, but I'm an old kook who even as a kid didn't "get" mismatched limbs on things. I wish Disney opted out of a "dig through mismatched bins and try to decide on a figure" concept in favor of a "here's a sack of parts for $30, make whatever you want at home" thing. But I'm lazy. When I go to the theme park I just want to make it fast, you can spend hours building these things which is a real good reason to buy several. I keep switching around parts and pieces and they're really fun to mess around with.